With the change over from CFC R-12 to HFC 134A there are a lot of choices to make when it comes to the type of lubricant to use. 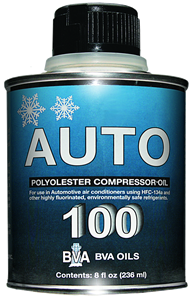 It is recommended that systems using R-12 continue to use mineral oil as a lubricant. When retrofitting to R-134A either PAGs or POEs may be used. All products are available in 8.5 ounce, 32 ounce,1 U.S. gallon, 5 U.S. gallon, 55 gallon, 330 gallon disposable tote, 550 gallon returnable tote and bulk truck and rail-car.